Amy died last night, just as I was drawing up her first dose of antibiotic. She had a good last day: I roasted some butternut squash for her and she ate and drank much better than she had in previous days. She was inquisitive, affectionate and enthusiastic right up to her final half hour when she became stressed and unable to get enough air. Although she was frightened she died quickly and I was with her. I think she knew how muchI loved and valued her. If I didn't know better I would say she chose her moment to leave us to save me the heart wrenching thoughts I would have had if I had administered the antibiotic and imagined a reaction to it had caused her death. She was a very gentle, lovely girl who didn't even reach two years of age. 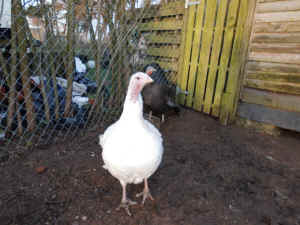 My strongest memory of Amy will be of the difference in her from her arrival at Eden in 2012 when she was rescued from a back yard poultry keeper with very severe, untreated mycoplasma and then how she was at the end of this winter when the days first got warmer and sunnier and she began simultaneously flapping her wings, hopping into the air as if she was dancing, and speaking in chirruping sounds. I can't but believe she was happy. 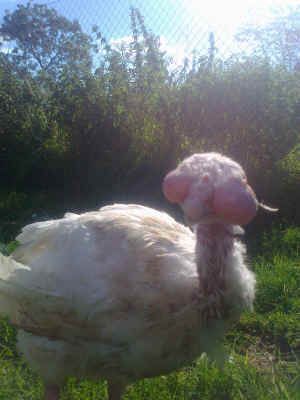 Amy will continue to be an ambassador for turkeys even in death: her photo will continue to be the 'face of humane meat'. Thank you all for your interest in helping her and for your support. The other animals humans eat, use in science, hunt, trap and exploit in a variety of other ways have a life of their own that is of importance to them, apart from their utility to us. They are not only in the world, they are aware of it and also of what happens to them. And what happens to them matters to them. Each has a life that fares experientially better or worse for the one whose life it is. Like us they bring a unified, psychological presence to the world. Like us they are somebodies, not somethings. Cowardice asks the question, 'Is it safe?' Expediency asks the question, 'Is it polite?' Vanity asks the question, 'Is it popular?' But conscience asks the question, 'Is it right?' And there comes a point when one must take a position that is neither safe, nor polite, nor popular, but one must take it because one's conscience tells him or her that it is right."